Diabolical disorientation? Oh, yeah baby. We are THERE. I have listened to three hours of lecture so far covering exactly eight paragraphs of text, and have half-a-dozen essay topics already, all of which illuminate what exactly it is that is going on in these dark days, both in the secular realm and in the Church. 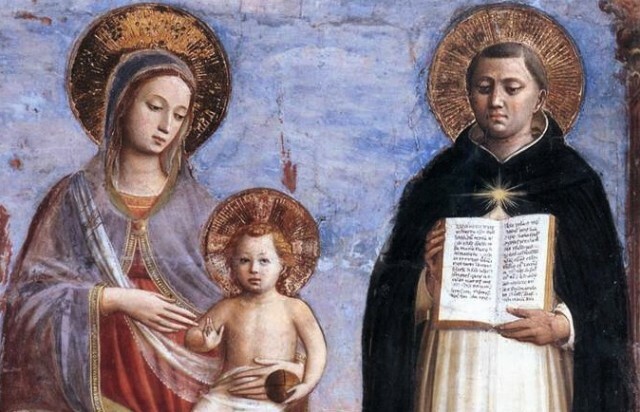 The first: So… what in the blue, fiery blazes is happening with this Synod on the Family thingy? In short, the infiltrators of the Church are trying to accomplish nothing less than the total destruction of the Church. They subscribe to the satanic heresy of MODERNISM, which is, quite possibly, the worst heresy ever. Pope St. Pius X called Modernism “the synthesis of all heresies”, meaning all heresies combined. Think of Modernism as the Super Wal-Mart of heresies. EVERYTHING is in there. And here’s where the metaphysics comes in. Allegory: A Modernist wallowing at the WalMartian bottomless slop trough of heresy. Modernism denies that there are any UNIVERSALS. Universals, in this metaphysical context, means things that DO NOT CHANGE. You know, like… God, Truth, His Law, Scripture and even mankind itself. Modernists, denying that there are any universals, thus insist that EVERYTHING is in a constant state of flux, and thus NOTHING can ever be parsed or … wait for it … JUDGED within the stable matrix of UNCHANGING TRUTH. Y’all see where we’re going with this? So, for example, Our Blessed Lord, the Second Person of the Triune Godhead, God Almighty Incarnate said in Matthew 19, “And I say to you, that whosoever shall put away his wife, except it be for fornication, and shall marry another, committeth adultery: and he that shall marry her that is put away, committeth adultery.” The “except it be” means that a husband can “put away” his cheating wife, but it in NO WAY says that he is free to marry another woman while the wife is still alive. He is not. The “except it be” is referring to the putting away, NOT “dissolving” the marriage. Because, you know, everything’s DIFFERENT now, because everything is in a constant state of flux, there is NO SUCH THING as UNCHANGING TRUTH, so what Our Blessed Lord, the Second Person of the Triune Godhead, God Almighty Incarnate said and the Holy Ghost recorded through the pen of St. Matthew is real cute and all, but come on. That was 2000 years ago. Maybe that applied to THOSE PEOPLE THEN, but no one seriously believes that you can apply these ideas to us today, because WE’RE DIFFERENT. The world is different. The CHURCH IS DIFFERENT. And, let’s be honest, people today aren’t just different – we’re BETTER. We have EVOLVED. And the Church, why it’s never been better! And how could it not be, because it has US, the new, different, BETTER men populating it! And so even what Pope St. John Paul the Second The Greatest Pope EVAH said just a few years ago about the indissolubility of marriage, heck that was SO THIRTY YEARS AGO, dude. And tomorrow, when Sister Joan wants to marry a dead female poodle, or whatever, then this will be fine because “the rhythm of the time” and the acrid stench, er, excuse me, the perfume of the people will be different than it is today, and WHO ARE YOU TO JUDGE anyway, because there is no such thing as universal, unchanging truth, therefore the entire notion of judging particular situations and actions is completely IMPOSSIBLE. How can anyone, including God Almighty, possibly say that ANYTHING is “intrinsically disordered” if there is no referential matrix that we can judge any particular thing against, because EVERYTHING is constantly changing? New Spirit. New Springtime. New Pentecost. Let us “Sing a New Church into being”, as the common Novus Ordo hymn says. Folks, this demonic, Modernist garbage is the living, breathing definition of “diabolical disorientation”. We’re there. Satan is now trying to completely undermine and destroy in the minds of men the entire notion of universal, unchanging truth. …And the Gates of Hell shall not prevail against it. This entry was posted in Uncategorized on October 10, ARSH 2014 by Ann Barnhardt. O Mary, Seat of Wisdom, so many persons of common intellect have made through your intercession admirable progress in their studies. I hereby choose you as my guardian and patron of my studies. I humbly ask you to obtain for me the grace of the Holy Spirit, so that from now on I can understand more quickly, retain more readily, and express myself more fluently. May the example of my life serve to honor you and your Son, Jesus. Amen. "He said he was from Liberia, not Africa…"
From this thread over at Lucianne.com. Emphases mine. It´s us. We are the reason for the panic. We vote for it, educate our kids with it, watch it on TV, “like” and “follow” it, and listen to its music. 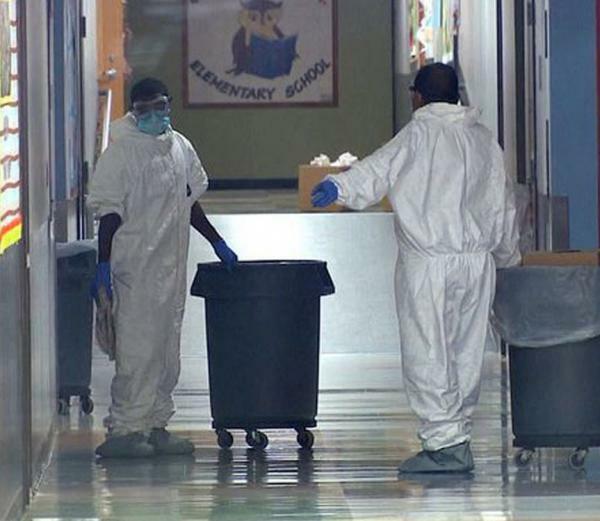 Here´s anecdotal evidence; my wife´s hospital is caddy corner to Dallas Presby, home of the ebola incident. The docs at her hospital left Presby to start a new, less screwed up system. So, they know Presby and keep in contact with former colleagues. Well, according to the old Presby docs, the thirty-something Dallas Presby nurse´s answer to the CDC was, “He said he was from Liberia, not Africa.” So, next time you want to believe the tin foil hat conspiracy theory answer, remember instead that we ARE that stupid and our stupidity is why we create the cases for panic. This entry was posted in Uncategorized on October 4, ARSH 2014 by Ann Barnhardt. I Wonder What His Thoughts on Guam Capsizing Are? Like I said, TOP MEN. Posted with nothing but a deep, heaving sigh. Just… yeah. There is speculation that Duncan is a psychopathic arch criminal, or that he was recruited by musloids to make the trip. Nope. I doubt this very, very seriously. Then how in the world, you may ask, could he possibly DO THIS? I’ll tell you the likely answer if you really want to know, but I warn you, our culture has conditioned even the “strongest” of you to reject the truth I am about to lay out. Are you sure you want it? Fair warning has been given. Complaints will not be fielded. The AVERAGE I.Q. amongst Liberians is 67. 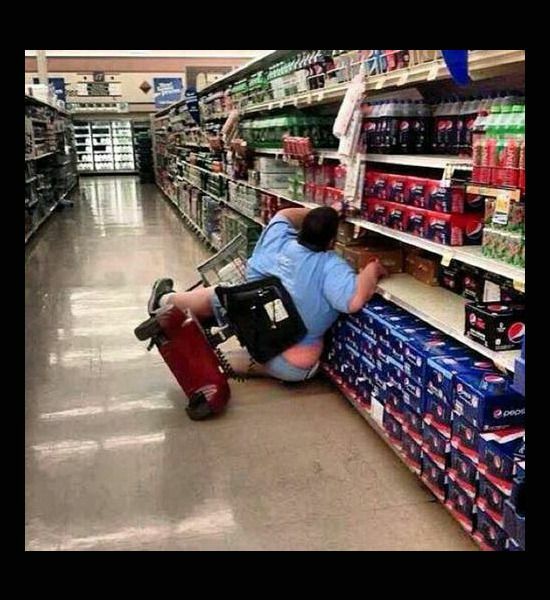 Anything below 69 is considered severe impairment. Only people who are profoundly mentally retarded, such as with severe Down Syndrome, have lower I.Q. scores, and many folks with milder Down Syndrome actually have I.Q. scores in the 70s and 80s. What we are talking about in Liberia is the AVERAGE IQ of non-impaired human beings. AVERAGE. Which means, by definition, that half the populace is above 67, and half the population is below 67. CITATION HERE. A ranking of nations by average IQ. Fascinating. Mr. Duncan, in all likelihood, got on a plane bound for Dallas because all was was thinking was “the Americans will save me”. He gave NO THOUGHT whatsoever to the consequences of his actions or to other human beings, nor did any of his family members, because people who are dim-witted think only about themselves and the immediate gratification of their immediate needs and wants. We see this manifested in our own western cultures, wherein people who OBVIOUSLY have lower I.Q.s are far, far more prone to crime – such as theft – and sexual promiscuity, as well as drug use, because they lack the powers of impulse control and consideration for other human beings that is an undeniable characteristic that goes along with an IQ that is several standard deviations “left” on the bell curve. When all you are capable of pondering is yourself and your own physical pleasure, or the maintenance of your own life, when a person or people is so collectively impaired that thinking through the consequences of actions three or four steps ahead, or of thinking of how one’s actions will affect other people, is almost impossible, then Thomas Eric Duncans happen. The first step to defending against this reality is to ACKNOWLEDGE IT. When all you are capable of pondering is yourself and your own physical pleasure, or the maintenance of your own life, when a person or people is so collectively impaired that thinking through the consequences of actions three or four steps ahead, or of thinking of how one’s actions will affect other people, is almost impossible, then contemporary American culture happens. I wrote this not just to make the point about failing to acknowledge and deal with objective reality, and how that is now LITERALLY going to kill people, I wrote it to hopefully rehabilitate Duncan’s reputation. I doubt he is a psychopath. I doubt he is a terrorist operative. I think he is just a sub-Saharan African who is probably teetering on the precipice of mental retardation, because that is what the odds clearly, clearly dictate. This entry was posted in Uncategorized on October 2, ARSH 2014 by Ann Barnhardt. There can be no hope of a sound rebuilding unless and until people understand what money actually is. As I covered in Parts One and Two of my Economics Presentation on YouTube, MONEY is a FUNGIBLE PROXY for man’s ability to labor, produce and create THROUGH TIME. Money isn’t gold. Money isn’t pieces of paper. Money isn’t zeroes and ones on a computer server. Money is human life and effort manifested in an agreed-upon form which is used as a convenient medium of exchange. This is why, for example, when Jon Corzine swept the MFGlobal accounts, one trader at the Chicago Merc (now housed in the Board of Trade building), who kept the majority of his wealth in his MFGlobal account, precisely because it was, according to the Rule of Law, the safest place to store wealth, walked up to one of my order clerk buddies during the first week of November of ARSH 2011, weeping, and said to him, “It’s all gone. All those years of work … its all gone.” Note the units. YEARS OF WORK. Not dollars, but “YEARS OF MY LIFE”. Yep. Let’s say I have a friend to whom I loan some of my money in the form of cash. Let’s also say that this friend, after years of study and hard work, has acquired a skill set that I would like to learn – let’s say welding. There are two ways that my friend can repay his debt to me. The first is for him to repay me in cash money – which is actually a DERIVATIVE. The second, and PUREST FORM is to repay me in his TIME and SKILL, which is the true underlying entity. Okay, so we would now have two choices of the form of repayment if we decide that he will repay me in his time and skill. First, we set an HOURLY RATE, because humans live their lives passing through time, and thus TIME is the baseline unit. Let’s say $20 per hour is the rate for tutelage in the skill set of welding. After every one hour lesson, I can reach into my wallet and hand him a $20 bill, which he would then hand immediately back to me, and I would then reduce the balance on his loan in my ledger by $20. OR, he could take every $20 bill I hand him over the weeks and months of welding tutelage, put it in an envelope marked “Ann”, and when he had the full balance of the loan saved up, hand me the envelope, and then I would close out the ledger as “paid in full”. THIS is how most people think they MUST do business. Since people wrongly think that money is the pure commodity itself, and NOT a mere derivative proxy, they insist that this “You hand me a $20 bill and I hand it back to you” maneuver is necessary. But it isn’t. In fact, it is silly. The SIMPLEST way to repay this debt is for me to simply strike $20 from the loan balance for every hour of tutelage, with no further exchange of cash. In fact, once the hourly rate for the tutoring has been set, the debt COULD be recorded not in dollars, but in HOURS OF HIS LIFE. This is why Marxism is so evil, and why the Seventh Commandment (Thou shalt not steal) exists. Forcibly confiscating the property of one person unjustly and giving it unjustly to another person is an act of violence and degradation – utterly denying and disregarding the humanity of the one (the “rich”), presumably in favor of the other (the “poor”). When this is done in the name of “charity” or “compassion”, it is, in a way, even more evil. Hey, at least with Jon Corzine we all know where we stand. Corzine and the other oligarchs feel free to steal other people’s property because they have no respect whatsoever for other human beings. When religious leaders falsely paint property confiscation and redistribution as “CHARITY”, which is, remember, a constitutive quality of God, namely the joy at the very existence of another – NOT the indifference to the life and existence of the other to which the denial of property rights is an obvious corollary – this is perhaps even more damaging to society. It is nothing less than calling good, evil and evil, good. Too bad the Pope doesn’t seem to have even the faintest understanding of this. He seems to believe that money is MERE paper, MERE zeroes and ones, with no connection whatsoever to actual human beings, and seems to have not the slightest understanding that it is the FREE GIVING of one’s money or property, which is simply a derivative proxy for one’s human capacity to labor, produce or create THROUGH TIME, that is charity, not being gang-raped by oligarchs spewing platitudes about “the poor”. And don’t even get me started on his seeming failure to comprehend that government debt monetization is the forcible confiscation of wealth from not just the contemporary non-oligarch class, but also from human beings who do not yet exist, and are thus utterly helpless. This is what happens when Affirmative Action picks the pope, and the influence of Holy Spirit is refused. But, “the Church is great precisely because She endures the smallness of men”, as Roberto de Mattei said so eloquently and presciently ten days before the election of Pope Francis. If nobody even understands what money is, how can we possibly hope to rebuild the economy, banking system and financial markets into something other than yet another iteration of the satanic maw of iniquity and villainy that we are now witnessing the implosion of? “Same song, second verse” is NOT a satisfactory goal. Not even close. Either do it right, or lay down, shut up and stay out of the way so that someone better than you can at least have a clean slate from which to start. Harsh? Yep. But true. So deal. The next installment in this series will cover banking theory and regulation. Pope Francis Bergoglio voluntarily kissing for the cameras the oligarch Cristina Fernandez de Kirchner, who has been instrumental in the pillaging of Argentina, and the violent stratification of the Argentine economy into super-rich micro oligarchy and massive, destitute, immobile underclass. But then, Peronist-Fascism isn’t really about economics or justice, it is about the acquisition and retention of personal power, and nothing more. This entry was posted in Uncategorized on October 1, ARSH 2014 by Ann Barnhardt. Clovis, king of all northern Gaul (France), was himself yet a pagan, though not unfriendly to the Church. He had married St. Clotildis, daughter of the Christian king of Burgundians, Chilperic, and she made repeated attempts to convert her husband. In 496, the Alemanni crossed the Rhine and the Franks marched out to drive them back. One account says that St. Clotildis had said to Clovis in taking leave, “My lord, to be victorious invoke the God of the Christians. If you call on Him with confidence, nothing can resist you”; and that the wary Clovis had promised that he would be a Christian if he were victorious. The battle was going badly against him when the king, either reminded of these words or moved by desperation, shouted to the heavens, “O Christ, Whom Clotildis invokes as Son of the Living God, I implore Thy help! I have called upon my gods, and they have no power. I therefore call on Thee. I believe in Thee! Deliver me from my enemies and I will be Baptized in Thy name!” The Franks rallied and turned the tide of battle; the Alemanni were overcome. Queen St. Clotildis was not trusting to any enthusiasm of victory, and sent for St. Remigius, telling him to touch the heart of the king while he was well disposed. When Clovis saw her he cried out, “Clovis has vanquished the Alemanni and you have triumphed over Clovis. What you have so much at heart is done.” The queen answered, “To the God of hosts is the glory of both these triumphs due.” Clovis suggested that perhaps the people would not be willing to forsake their gods, but said he would speak to them according to the bishop’s instructions. He assembled the chiefs and warriors, but they prevented his speaking, and cried out, “We abjure mortal gods, and are ready to follow the immortal God whom Remigius preaches.” St. Remigius and St. Vedast therefore instructed and prepared them for Baptism. To strike the senses of barbarous people and impress their minds, Queen Clotildis took care that the streets from the palace to the church should be adorned with hangings, and that the church and baptistery should be lighted with a great number of candles and scented with incense. The catechumens marched in procession, carrying crosses, and singing the litany; St. Remigius conducted the king by the hand, followed by the queen and the people. At the font the bishop is said to have addressed Clovis in words that are memorable, if not actually pronounced: “Humble yourself, Sicambrian! Worship what you have burned, and burn what you have worshipped!” Words which may be emphatically addressed to every penitent, to express the change of heart and conduct that is required of him. 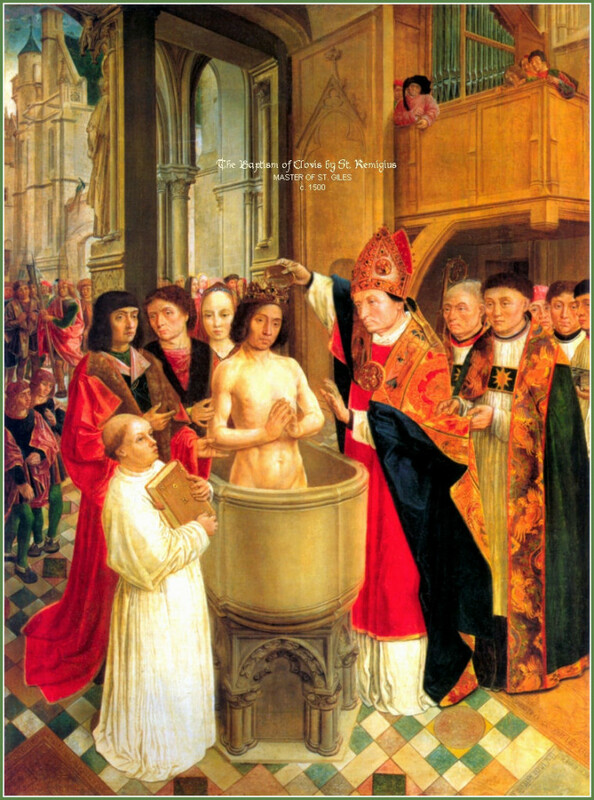 St. Remigius afterwards Baptized the king’s two sisters and three thousand men of his army, as well as women and children, with the help of the other bishops and priests present. St. Remy, pray for us!